Money is a reality of life. I am not so naive to not understand that it takes money to accomplish conservation and protection. Lofty ideals though they may be, their societal value is burdened with a heavy cost. Capital is required to accomplish these objectives and certainly there could always be more to go around. It is with this rationale that people are marketing the NCA agenda. During various discussions with interested participants there are three main points that are repeatedly identified for potential revenue sources to compensate for the cost of this agenda. The first and most widely touted potential source of added wealth is a congressional appropriation that would be tied to a congressional designation. It is true that some other NCA designations have gotten a congressional appropriation. However it is small in respect to the actual total cost of managing the area and the appropriation is actually estimated to decrease with time (see Red Rock Canyon NCA 2010 Business Plan). It is time to face reality and recognize that a congressional appropriation is not going to happen in this economic climate. At a time when every other week we are faced with a government shutdown over debt ceilings, FEMA, the FAA or any other potential increase in spending, the belief of additional funding on top of the Interiors current budget is nothing more than failing to face the reality of our current circumstance. 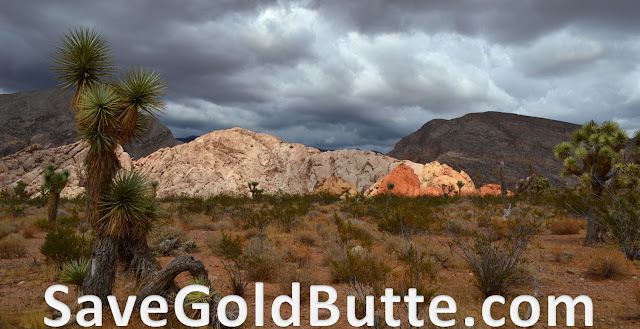 One of the other lines of reasoning used to push the NCA agenda is that the higher level of protection will give Gold Butte higher standing when funding is allocated in the regions yearly budget from the Interior. This means that there is no new money allocated to the BLM to manage the region, instead more will have to be allocated to Gold Butte because it deserves preferential treatment. There is no doubt that Gold Butte is deserving however, there are many deserving public lands within the Southern Nevada District and none can afford to lose even one dollar of their current allocation. Let us not protect one at the sacrifice of the other. If the true intention is to truly provide better public lands management then “special” designations only mean other places are not special. This does not correspond with the holistic approach of responsible public lands management. It only draws out that these special designations have become a vehicle to drive an agenda for one particular interest. SNPLMA money is drying up. This is money that resulted from the sale of BLM lands with the proceeds devoted to the acquisition of environmentally sensitive lands and other conservation initiatives. It was a great source of revenue while it lasted however it cannot be counted on as a reliable source for future funding. The graph clearly shows the trend. Funding is a major component of any plan but it is not the only component. Reckless recognition, entrusting fate to chance in the vain hope of money, will work only to further complicate public lands management. Calling for a designation without first having a detailed management plan works only to expose the shortcomings of that designation and those calling for it. A one, five and ten year plan has to be developed that identifies what needs to be accomplished and the costs of such plans. This way management can evolve with awareness to its short comings and labor to remedy itself. We need to prioritize the conservation efforts so as the budget adjusts other potential revenue sources can be identified. Private\Public partnerships can work together to fill in those resource gaps and accomplish those objectives that benefit the overall good of the area. We need to move past vain political and self-interest and build a plan that will accomplish conservation and provide social benefit to the community and our public lands. This can be done not in ignorance of the cost but with conscious consideration of such.